First climbed en route to first ascent of Mt Whitcombe’s North East Ridge. Follow the rock ridge from Erewhon Col to the summit. Follow a couloir to the left of the lowest rock buttress, take a diagonal traverse and eventually reach easy snow slopes to the summit. From the unnamed glacier between the Bracken and Snow Dome, a gravel shelf leads diagonally up to the wide, flat col 300 metres north-east of Erewhon Peak. A moderate snow shoulder leads on to the peak. 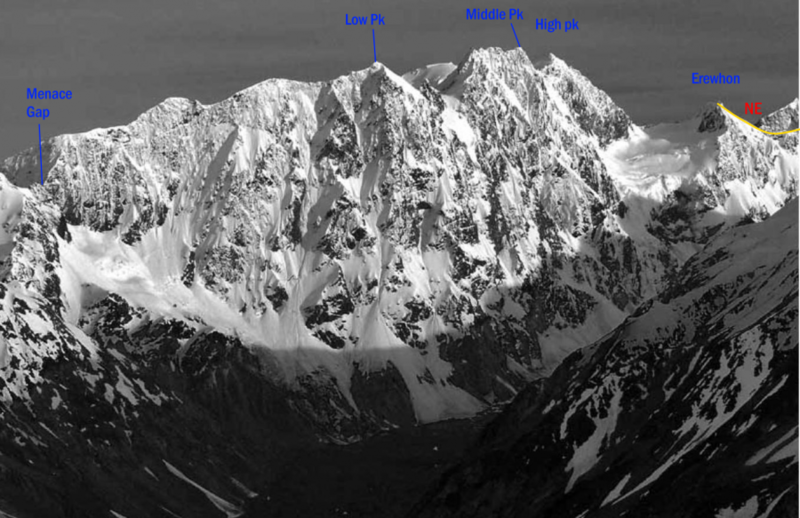 Alternatively, from the unnamed glacier follow up the glacial shelf north of Mt Whitcombe and follow the west ridge, sidling on the northern slopes as necessary.